G.P. Putnam's Sons Books for Young Readers, 9780399247903, 40pp. In a country struggling with acceptance, hope can come in many different forms. As a boy, Hector loved playing soccer in his small Johannesburg township. He dreamed of playing on a real pitch with the boys from another part of the city, but apartheid made that impossible. Then, in 1990, Nelson Mandela was released from prison, and apartheid began to crumble. The march toward freedom in South Africa was a slow one, but when the beloved Bafana Bafana national soccer team won the African Cup of Nations, Hector realized that dreams once impossible could now come true. This poignant story of friendship artfully depicts a brief but critical moment in South Africa’s history and the unique role that sports can play in bringing people together. An avid soccer fan, Phil Bildner has sat on the Real Madrid bench at el Estadio de Santiago Bernabéu, and he has watched from the bleachers as Lionel Messi scored a hat trick during an Argentina-Brazil showdown. Away from the pitch, Phil was an attorney and taught middle school in the New York City public schools. He is the author of the Texas Bluebonnet Award–winning Shoeless Joe & Black Betsy, and the co-author with Loren Long of the New York Times bestselling Sluggers series. Jesse Joshua Watson has traveled extensively, developing a deep passion for sharing the beauty of the world’s cultures. He has always cared deeply about South Africa—in high school he campaigned for Nelson Mandela’s freedom by organizing awareness and student action. 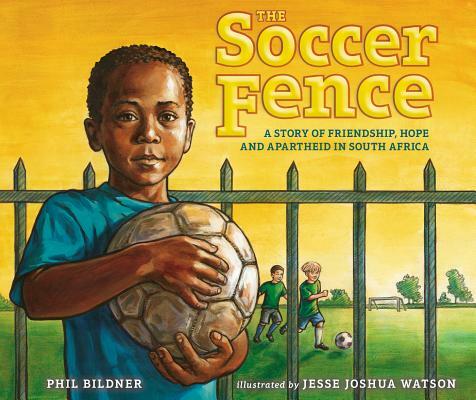 In addition to writing and illustrating books and teaching art to kids, Jesse plays soccer religiously. He lives in Port Townsend, Washington, with his wife and their sons.